We did not hook a fish. Boom, that's done and out of the way....now the story of an epic fishing trip. 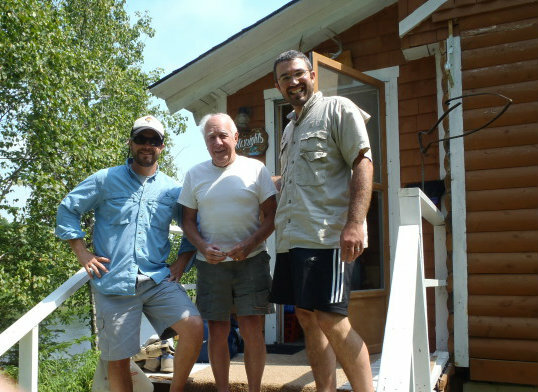 It all started this spring as Wilkie befriended a kind chap on one of Maine famous western rivers. Wilkie and I went to investigate this camp and see what this famous river held. 290 Miles through north eastern Maine and New Burnswick . This was the kind of camp that people dream about, awesome location, the perfect ambiance......let me show you. So we did what any of you would do, we fished hard. Then we relaxed and had a cirbbage game with our host. 4:30 Martini's on the deck. We fished it boys, every tide, early morning, late at night and had no fish. Stopped at a cool fly shop in Doaktown, NB called W.W Doak, so we thought we had the right flies. We fished about 2 miles of river as well as any solidhookups member does and nothing. It was nice to see the guys around us not catching any either. And by the way... there were some "guys around us"
32 other fisherman in this shot. Low water and warm water temps were the issue. We did see some huge fish rolling and jumping as they made their way up stream but other than a few chubs and a 14" schoolie striper I landed Sunday morning, it was a skunk. A fine trip indeed and many thanks to those that made it possible from lodging to intel and spirited conversations. We learned many things: New Brunswick locals have funny accents, Brights (fish returning from the ocean in summer) are exponentially more difficult to catch than Blacks (atlantics returning to the ocean in the spring). Flies swung for Atlantics are steeped in tradition. Out of perhaps 150 people seen on the river in three days we witnessed 4 hookups, 2 landed. We saw fish up to 40" jumping clear out of the water (locals tell us these fish will not take as they are shedding sea lice; rolling fish are better, we saw very few rollers). The river fell some three feet in the week prior to our arrival, locals claimed we should have been there last week. Fish will continue to come into the river throughout the summer into August. People get upset with other people on the Miramichi much like on the Salmon River. One such dude wanted to fight Jasper and I fish fishing his personal pool (it was not his personal pool, nor was the land he claimed was his own along the shore). There is a crazy striper run on the Miramichi....believe it, we saw pictures and signage along the river (no idea how this is possible). I'd do this trip again in a second. One brief clarification, we didn't LAND any fish, but we both stung a fish. Mine came in the first hour on a green machine; I saw the fish push water and take the fly, a thrash or two later it was over. Jasper stung a fish farther down river; 3 serious bangs one after another then game over. The few fish that were running into the river were crusiing straight through as a result of limited holding water and those that were holding were holding in a Rotation Pool at the mouth of the Renous River where, when busy, it could take a man an hour and a half to even get into the rotation. This pool was the only place that we personally saw fish holding in a position underwater. I did it twice and on each time through the old dude in front of me in the rotation hooked a fish. One beast was lost, one fish around 24" was landed. well i'll be! great tale, gents. i believe you will be back there. were all your flies subsurface? throw any two-handers? you guys have a boat? how was the tabac? A solid adventure indeed. The fish of a thousand casts does not come easy. I guess you guys will have to go back next year.